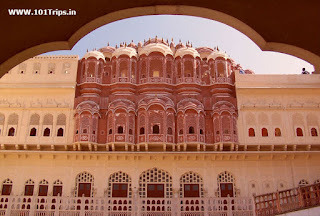 It was built in 1799 by Maharaja Sawai Pratap Singh of Jaipur. Built in a mixed form of Rajasthani and Persian architectural styles, this building is situated on the way to silver mint from Jaipur's 'Big Chowpara' intersection. The main part of the air-condition seen by the main road is actually the great part of it. This is its identity throughout the world. 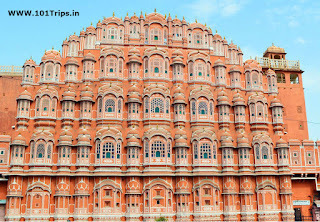 Most tourists go to see 'Hawa Mahal' from this point of view. But the building is equally worth watching from inside. The state museum has been built in some parts of the Hawa Mahal. It is safe to have many precious heritage associated with ancient cultural heritage. Harmmahal has two doors named Anandapol and Chandpol. Due to Ganesha statue created on Anandpur, it is also called Ganesh Pol. Rajput style decorations of vellors are also visible in Chandpol. Inside there are two large squares. A large room is built in the middle of a square. Many ancient statues and other antiques are stored in this room. Nearby is a collection of painting and handicrafts in a room. This room was originally the Bhojshala. Photos of some important Maharajas and eminent personalities of Sawai Jai Singh and the Kachwaha state of Jaipur are displayed in the Sharad Temple Room. In the museum galleries built in different rooms, sculptures, stones and copper equipment, copper letters and coins are also worth seeing.